Where in the World is Rebecca Today? » I Passed My Driver Theory Test! I Passed My Driver Theory Test! I applied for my Learner’s Permit back in October 2014 because I wanted a photo ID before my trip to the US the following January (Jan 2015) that wasn’t my passport. I might be 36, but I surprisingly get carded in the US. And, of course, I planned on learning how to drive. In the UK, learning how to drive and getting your license is a three-part process. Well, more than three when you add in everything you need to do. Step 1: Apply for your provisional. This is really easy and you just go to the Post Office for a form, and send off the application with the fee, a photo of yourself, and your ID (passport if you are foreign). You can send them a self-addressed postage paid envelope to return your documents (I used one with tracking). It only takes about two weeks. Step 2: Get car insurance. If you have someone else in your house who own a car, ask them to add you as a named driver. All Tim had to do was ring up his insurance (Directline) and it was around an additional Â£100 to add me for the year and the only difference is I have a higher deductible than Tim. If you have US driving experience and it hasn’t been forever since you had a valid license in the US, some UK insurance companies will accept your no claims bonus, but I haven’t had insurance in the US since 2008 so I didn’t bother. It probably also helped that I’m older than 25. Step 3: Book lessons. As an experienced driver, I contacted a few local driving schools to ask them what options they had since I know the basics of driving and needed to learn 1) manual transmission and 2) how to drive on UK roads/how to pass the test. I found a school that was willing to offer me the same introductory rates as a new driver, but start me right away behind the wheel (instead of explaining “this is the brake/this is the gas/etc”). 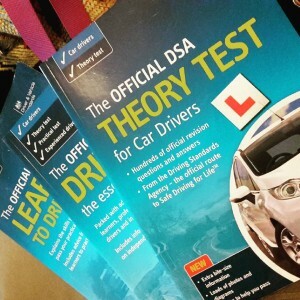 Step 4: Book your Theory test. Apparently, the DVLA has been seriously backed up and in some places it’s taking up to three months just to schedule the theory test. When I went online to schedule mine, I had to schedule it for five weeks away from the date I was booking it because it was the first date available. I would have liked to have taken it sooner, but it gave me plenty of time to study. The Hazard Perception test is a separate section to the Theory, and a separate score. You need to pass BOTH sections in order to have passed the theory test, and if you fail one, you retake both. The Hazard Perception is a series of scenarios and you have to click when you see a developing hazard. Sort of similar to that simulation from Driver’s Ed in the 90s with the brake pedal and the ball rolling into the street. In the Hazard Perception test, you can score up to 5 points on each scenario, but one is worth 10 (it’s a double hazard). The later you click, the less points you get…but if you click in a pattern or the computer thinks you are clicking on everything, you don’t get *any* points! There is an app for this, but since you will be taking the test at a computer with a mouse, I felt it would be better to practice on a computer. The DVD cost Â£15 at WH Smith, so all in all we spent around Â£45 just on study aids. But this test is tough, and it only has a 50% pass rate for most testing centres! And since you have to pay Â£23 for the test each time you need to take it…well, you want to study as much as you can and use as many resources as you can. They even have the practice tests online for free, so if you didn’t want to pay for as many applications or books, you could take the tests online (but they don’t have the Hazard Perception test online). Step 6: Take (and pass) the Theory test. You get given a set of instructions to follow the day of your test, and these include not bringing anyone with you to the test (Sorry Tim! ), turning your phone off, and locking your phone, watch, tablet, handbag, jacket, and basically anything else you have with you in a provided locker. The only thing you are permitted to take into the testing room is your provisional license and the key to the locker. The test starts out with a short 15-minute maximum practice session just to get you used to the way the test is conducted. Then, the computer gives you a timed 1-minute break (But you can skip ahead) before starting the theory test. The test is 50 questions long, and you have 57 minutes. You can flag questions you are unsure of and then at the end you can either review your entire test or just review your flagged questions. At the end, the test will also tell you if you failed to answer a question, so make sure you check! You need to get at least 43 questions correct, so I flagged the questions I wasn’t 100% on and at the end I had only flagged 5. If I had all 5 of those wrong, I still would have passed the test. But I went back and in the end I only had 2 questions I was unsure on. After you click the final submit button, it gives you a three-minute break (you can skip this or take less than three, but after three minutes it will move on to the Hazard test). Just like the Theory test, the Hazard perception test will give you an example/practice test, then a one-minute break before starting the test. The Hazard part is 14 clips and each clip is probably around a minute long. You just click when you see the hazard developing. When you’re done, you get up and leave the room and your print out with your score will be waiting for you with the receptionist. And check out my score! 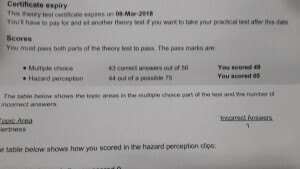 *one* question wrong on the Theory, and 65/75 on the Hazard perception! They break down the score for you, so I know I scored 9 points on the double hazard, and then mostly 5s and 4s, with only 2 points on two of the hazards. Step 7 is of course, scheduling, taking, and passing the Practical. Watch this space!